If you spend any time at all skiing at a Nordic center, it won’t be long until some old Scandinavian floats by going twice as fast and working half as hard. The good news is that the more you ski, the better you get. The bad news is that it takes time to get good at the diagonal stride. If you want to float over the trails, a certain patient persistence is required. Start by being patient with yourself each time you head out on classic skis, especially if you already are a competent skater. Unlike skating, where I find it fairly easy to pick up where I left off after a few strokes, it seems to take three or four kilometers just to remember how to make the skis grip while smoothly forward from one to the other. When you are warmed up and ready to focus on floating forward like that old square head that passed you, try skiing as fast as you can and as slow as you can as you feel your way into the diagonal stride. Somewhere in the middle is where you will find the best combination of tempo, quiet glide, and a long push. 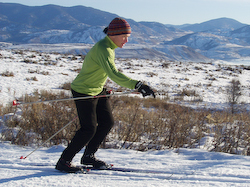 Regardless of your tempo, always maintain a crisp weight transfer from ski to ski. Ski as low as you can and ski as erect as you can. Once again somewhere in the middle will usually be the most efficient blend of deeply flexing for power and riding on your bones for increased endurance. As you feel your way into a more relaxed and powerful stride, and watch that old lady lap on you the trail system, it helps to remember that the essence of the stride is not captured by the photogenic image of a classic skier in full extension. Here’s what to look for behind the dash and flash. Skier moves onto a flexed ankle. The knee and waist are flexed and the spine is parallel to the shin of the front leg. The front knee leads the foot as weight is transferred to the next ski, which continues smoothly forward without interruption as it swings onto the snow and glides forward. Complete extension of the rear leg and foot signals the end of the leg push and the rear arm is extended and the fingers have released the handle of the rear pole. Rear leg is relaxed as it swings back as a result of complete extension. Core is behind the front foot as the leg swings back. The rear leg provides a counter balance to the skier’s torso. Arm is bent at the elbow as the pole is planted. Pole angle to the snow varies with speed, but the hand is high and the elbow is near but outside of the pole shaft as pole push begins. Core continues to rise and moves forward of the front foot during poling. The core rises as a result of the last push-off as the ski glides and poling begins. With weight transfer completed, the front leg extends slightly as the hips and torso move forward and the knee and waist open. Opening of the front ankle occurs from sliding the front foot forward t from dropping the core back. With speed, the skier glides before poling begins. In slow snow and on hills, this phase may be very short. The core anticipates and leads the movement toward the next ski. Front ankle flexes to start movement onto the next ski with a forward fall. Rear leg remains relaxed and is pulled forward by gravity. The upper leg begins to swings forward from the hip like a pendulum. The skier flexes at the waist and the knee to keep the spine parallel to the front shin as ankle flex increases. Front ankle is deeply flexed as feet pass. 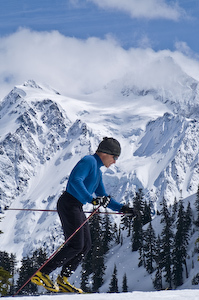 Core is forward of the feet and the ski grips the snow and stops before the feet pass. 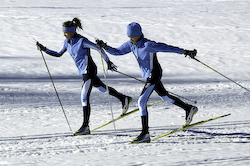 Ankle and knee of the rear leg are also flexed as the ski swings beneath the hip. Poling hand is near the thigh; recovering hand is driven forward and is in front of the body. The new ski is set in motion before moving onto it. 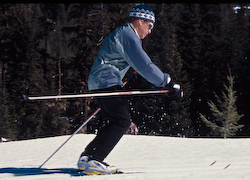 The knee, thigh, hips and torso continue forward after the foot stops, moving the core well in front of the feet and driving the ski forward. Before weight is transferred to the new ski it is almost up to speed, skimming the snow like a hovercraft. 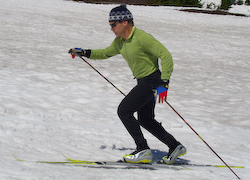 Heel stays on the ski as the leg is extended and the new foot moves in front of the push off foot. Heel lifts off the ski only after the leg has been fully extended and the ankle opens. The Pause that Refreshes from Steve Hindman on Vimeo.